Srinagar : Legal Aid Clinic for Juveniles, Department of Law, School of Legal Studies(SLS), Central University of Kashmir(CUK) organised a day long workshop on ‘Juvenile Justice System in Jammu and Kashmir: Role of Stakeholders’ and working session on Material Preparation on Juvenile Justice Laws’ held at Central University of Kashmir (CUK), Nowgam Campus-I, here on Tuesday. Vice Chancellor, CUK, Prof. Mehraj Ud Din Mir, former judge, Jammu and Kashmir High Court, Justice Muzaffer Hussain Attar, Head and Dean, School of Legal Studies, CUK, Dr. Sheikh Showkat Hussain, Assistant Professor Ms Gulafroz Jan, Department of Law, CUK, faculty, students, scholars from different Universities and colleges and other delegates were present on the occasion. 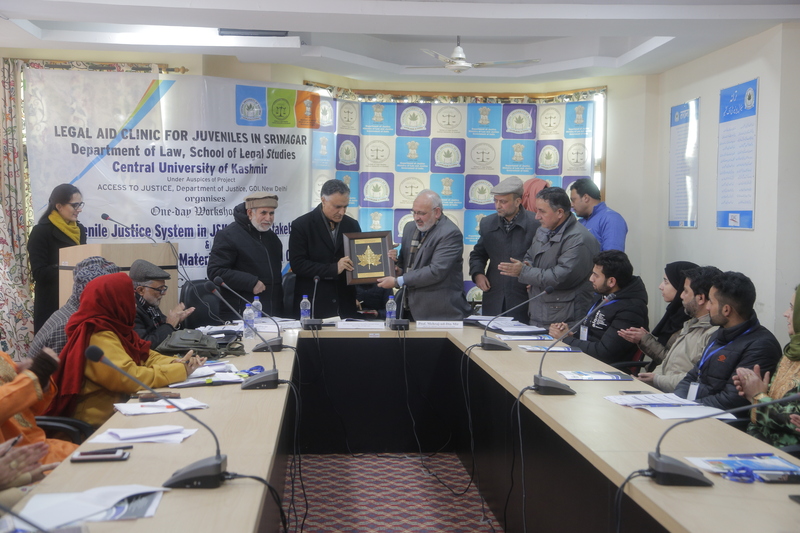 Zaffer A Shah, Sr. Advocate, J&K High Court in his valedictory speech appreciated the concept of this workshop and also said that such programmes must be given publicity for the benefit of masses. During the workshop prizes were distributed among the winners of speech/debate and quiz competitions held earlier in the different colleges of valley. The programme proceedings were conducted by Suwaiba and Mehreen and vote of thanks was proposed by Mohammad Yousuf, Assistant Professor, Department of Law.